You may not decompile, "reverse-engineer", disassemble, debug, or, otherwise attempt to derive the source code for the modification or its networking. Usage of all API functionality within reason and should not cause detrimental performance for the game servers. Accessing services provided by TruckersMP is not a right, it is a privilege and it may be revoked at any time. If you have any questions regarding these terms of service, please contact support, the feedback section or post on our forums. This part covers the downloadable components of the modification and is provided here as a curtsy, current EULA is always in the download and is the authoritative source should they differ. This copy of Euro Truck Simulator 2 Multiplayer and American Truck Simulator Multiplayer ("the Software Product") and accompanying documentation is licensed and not sold. This Software Product is protected by copyright laws and treaties, as well as laws and treaties related to other forms of intellectual property. 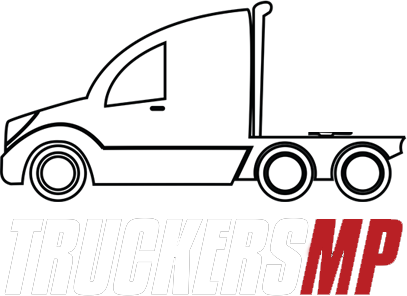 TruckersMP Team or its subsidiaries, affiliates, and suppliers (collectively "TruckersMP Team") own intellectual property rights in the Software Product. The Licensee's ("you" or "your") license to download, use, copy or change the Software Product is subject to these rights and to all the terms and conditions of this End User License Agreement. THE SOFTWARE IS PROVIDED "AS IS", WITHOUT WARRANTY OF ANY KIND, EXPRESS OR IMPLIED, INCLUDING BUT NOT LIMITED TO THE WARRANTIES OF MERCHANTABILITY, FITNESS FOR A PARTICULAR PURPOSE AND NONINFRINGEMENT. IN NO EVENT SHALL THE AUTHORS OR COPYRIGHT HOLDERS BE LIABLE FOR ANY CLAIM, DAMAGES OR OTHER LIABILITY, WHETHER IN AN ACTION OF CONTRACT, TORT OR OTHERWISE, ARISING FROM, OUT OF OR IN CONNECTION WITH THE SOFTWARE OR THE USE OR OTHER DEALINGS IN THE SOFTWARE. You may not decompile, "reverse-engineer", disassemble, debug, or, otherwise attempt to derive the source code for the Software Product. You may not use the database portion of the Software Product in connection with any software other than the Software Product. You may not redistribute this Software Product on any other websites that are not official mirrors. You may not scan, "reverse-engineer" network connections of this Software Product. Prohibited from use for promotion and advertising of other products without the permission of the authors. Truckersmp.com (hereby referred to as "Main website") is the primary portal to which you register, obtain the modification, appeal a ban, report rule violations, get help from support and obtain news information from the blog. All of these components and all served from under the primary domain is covered by this. Access to the main website and its downloads is provided to anyone who has confirmed ownership of either SCS' Euro Truck Simulator 2 or American Truck Simulator. Accessing parts of the website, downloads included, without fulfilling the above is strictly prohibited. If you find security vulnerabilities in the website you may report them to security at truckersmp.com, we do not, unfortunately, offer a bug bounty. If you believe you found an issue that may damage data, do not try it, report it and we will test your theory in a safe environment. If a vulnerability is found and not reported responsibly, it will be treated as a security incident and reported to the appropriate authorities. When you submit a report on the website, you agree to give TruckersMP and its staff a limited license to use provided evidence and re-upload it for safekeeping and use as evidence related to punishments issued. api.truckersmp.com (hereby referred to as "API") is used by the game servers and third parties in an automatic fashion. Its primary function is to serve the game servers and the game client. Access to the API is provided freely within reason to third parties (just make a GET request to the endpoint you are interested in), but may be revoked should a third party cause issues that deter the quality of service to the game servers and/or the game client. Revocation of access is purely at the discretion of the TruckersMP Team, though generally, we will try to make an effort to identify the owner of the offending API consumer and contact them should it be a temporal issue. forums.truckersmp.com (hereby referred to as "forums") is the community forums where users may discuss things related to TruckersMP, Euro Truck Simulator 2, American Truck Simulator and other things. The community forums are provided as a curtsy to our users and require a valid TruckersMP account. Access to the main website and its downloads is provided to anyone who has confirmed ownership of either SCS' Euro Truck Simulator 2 or American Truck Simulator. If you find security vulnerabilities in the forum software you may report them to security at truckersmp.com, we do not, unfortunately, offer a bug bounty. If you believe you found an issue that may damage data, do not try it, report it and we will test your theory in a safe environment. If a vulnerability is found and not reported responsibly, it will be treated as a security incident and reported to the appropriate authorities.